Does anyone remember the Who and the Kinks playing the Hertford Corn Exchange in the 60s? A Hertford woman went to these concerts with three friends but can’t remember the date – it would have been mid to late sixties. She remembers the Kinks wearing their bright red hunting jackets. At the Who gig they went back stage and her friend was given John Entwistle’s guitar string! If you went to the gigs or have any more memories you’d like to share please add a comment below or follow this link to find out how to add your own page. This page was added on 19/04/2010. I believe I saw The Who at the corn exchange 1964,I didn’t recognize them until they played I can’t explain which was released in 64. I was there with my sister, and we also went backstage. I have their autographs and the date I have written in the book is 13th March 1965. However, not long before my sister died, we went to Hertford and the door to the now smaller venire was open and we went in for nostalgia’s sake. They had a framed handbill saying 25th March ’65. So, around that time. I was there and as I remember it the Kinks appeared at the Corn Exchange a week before “You Really Got Me” reached No.1. This puts it in August 1964. I also remember their red velvet hunting jackets an ruffed shirts. I also saw at the Corn Exchange The Swinging Blue Jeans, Screaming Lord Sutch and Johnny Kidd and The Pirates. Unfortunately, ask me what happened last week and I struggle to remember! The Kinks gig was Saturday 25th June 1966 according to Doug Hinman in his book “All Day And All Of The Night”.Cheshunt resident John Dalton previously of the Cheshunt band The Mark Four had earlier that month replaced Pete Quaife on bass guitar. He remained a Kink until November 1966 when Quaife returned. John rejoined The Kinks full time in 1969 leaving in 1976. 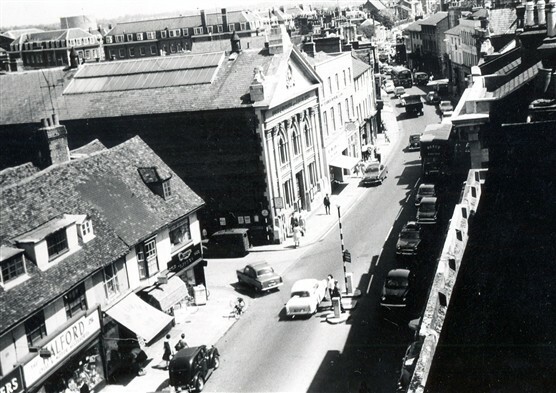 I believe the ‘Kinks’ concert at the Hertford Corn Exchange would have been in 1964. I remember I was unable to attend this as I was away for the weekend on an induction course for my first job after leaving school that year. I was envious as 2 of my school friends met the Kinks backstage on that occasion as one of them had won a competition. I did see ‘The Who’ performing at the Corn Exchange in 1966 and, on this occasion, it was ‘packed out’. My friend met Roger Daltry in the Warren House pub that evening and he bought her a drink! According to the book ‘The Who concert file’ it was 25 March 1966. The Kinks’ early appearances are are less well documented.